t*rexes and tiaras: Tuesday Titles 029.. I remember the first time I picked up a Lisa Gardner book was when I was stood in my local library with no idea what to read next. I sent a "help me!" text to Alex and she replied with a list of authors. Since then, she's definitely been up there in my list of top thriller writers. They say family means everything. But Dr Adeline Glen cannot accept that. When you're bound by blood to a father who slaughtered prostitutes and a sister who followed in his sociopathic footsteps, how can you? It sounds good, right? I was pretty excited to start this one, and it didn't disappoint. I was instantly intrigued by the concept of pain and what it means. Adeline Glen has a rare genetic condition where she can't feel any physical pain and yet has made pain her business as a professional pain therapist. She is also the daughter of a serial killer, who died when she was a baby. Her sister Shana is spending her life in a high security prison after killing her first victim when she was just 14 years old. Adeline seems fairly normal in comparison to her birth family, but Shana reminds her during their monthly visits that she can't escape the fact that blood is love. D.D. on the other hand is suffering with a lot of pain after an incident at a murder scene she was investigating. The only problem is, she can't remember what happened. All she knows is that she is having to learn to deal with the pain and the aftermath, one day at a time. A colleague suggests that she visit Adeline in order to try and learn to manage her pain and reluctantly she does so, until she connects the dots and figures out who Adeline's family are and how she might be able to help with something else. Several murders have been committed by the Rose Killer who leaves champagne and a rose with each and every victim, as well as a small detail which makes the killings look exactly like the ones which Adeline's father, Harry Day committed all those years ago. How can the Rose Killer know so much about those killings? I found this book totally compelling; I read most of it on the cross trainer at the gym the other day. Best book I've read for a while! Hmm, I don't think you'd like - it's pretty gory in the detail. 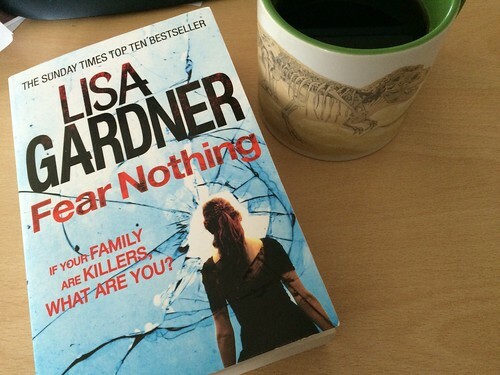 I read this a couple of months ago and loved it, Lisa Gardner writes such tense, thrilling novels and I've enjoyed them all but I think this one was a favourite. Yes, I think it's mine as well, although I've only read a few of her books. I find them pretty compelling though.